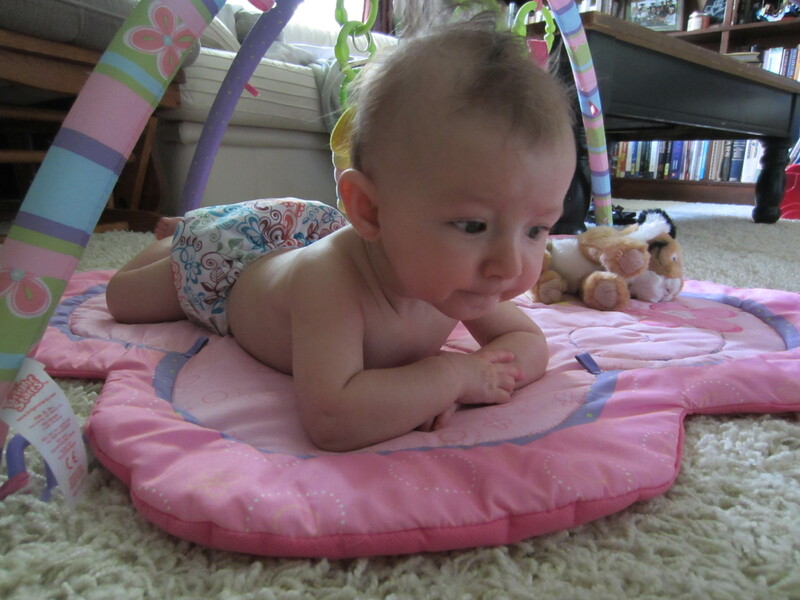 The fear of cloth diapering is just like anything else…a fear of the unknown. What boggles my mind is that people will go to great lengths to avoid using cloth, so that they don’t have to face that fear. They’ll even take it to the extent of putting a disposable back on their kid after scraping off the poop. Seriously. I recently heard about this from a friend and had to look it up. Here’s what I found out: Joanne Samuel Goldblum, a very charitable woman no doubt, started a non-profit organization to gather disposable diapers for low-income families. She did this because she ran into a woman named Angie who literally scraped the solids off her baby’s diaper and then put the used diaper back on the baby. It seems that Angie couldn’t afford diapers, so this was her solution. Since I started out cloth diapering to save money (and consequently learned to hate disposables and love my fluff [that’s cloth diaper geek speak for, well, ‘cloth diapers’]), my first question was, why didn’t Angie use cloth? And more importantly, why didn’t Joanne Samuel Goldblum start an organization providing cloth diapers to low-income families? At least that way they wouldn’t run out and their babies wouldn’t grow out of the diapers they do have. And flats, which are the old fashioned flat diapers, are really cheap. Heaven forbid she use the sink. Now before you sneer at me and say, “Yeah right Kathleen. Like you would hand wash your diapers if you didn’t have a washing machine,” let me just say that it can be done and I really don’t think it would be that bad. I’ve often wondered what would happen if my washing machine broke down and I was on my own for a few weeks. I really don’t like putting those incredibly uncomfortable looking disposables on my child, and the idea of reusing them makes me shudder. When I went to write about this, I found I had a wonderfully appropriate confidence booster on this very topic waiting in my inbox. It just so happens that Maria, who writes one of my favorite blogs, Change-Diapers.com, decided to challenge herself this past week: she only used flats and she only hand washed them. Final Thoughts – #Flatschallenge Day 7, Maria’s concluding thoughts at the end of the challenge, assured me that it’s not the end of the world. I’m not saying I’d give up my fancy one-size-fits-all pocket cloth diapers for flats. And I’m not saying I’d happily hand wash forever if my washing machine broke. What I am saying is this: If money is an issue, consider cloth. If you want to donate to a charitable organization to help poor mothers keep their children properly diapered, consider cloth. Fluffy Wishes in Bloomfield, IN, for example, provides cloth diapers for low-income families. If you’re unsure or a little afraid of braving into the cloth diaper world, talk to someone who primarily uses cloth diapers and learn how to use them yourself (or post questions below and I’ll try to write detailed responses in future posts). Just remember…once you dive in, the water’s fine. Love this post! I love cloth diapers already and I’m yet to use them (my little one is due in about ten weeks). That made me want to be sick about scraping off disposables! Yuck!! First of all, congratulations! And thanks for letting me know about the give away…I just entered it. I’m finding myself more and more drawn to natural items, even though I never considered myself much of a naturalist. It’s funny what having a baby does to you, isn’t it? Great post! Randy and I read that article, too, and immediately emailed one another with “cloth isn’t that bad!” I understand that there may be circumstances where it isn’t possible, but it shouldn’t be outright dismissed as an option, especially as a diapering solution for folks who are having a hard time making ends meet. And I think it could work for more people than realize it! Also–I lurve my prefolds and covers, even more than my pocket diapers! Super inexpensive and effective!